Our Cruisers Yachts and Sport Boats are more than just boats — they're family. From the unrivaled quality, style, and luxury of a Cruisers Yacht to our fast and stylish, smooth and comfortable Cruisers Sport Boats, you'll never want to head back to the dock. 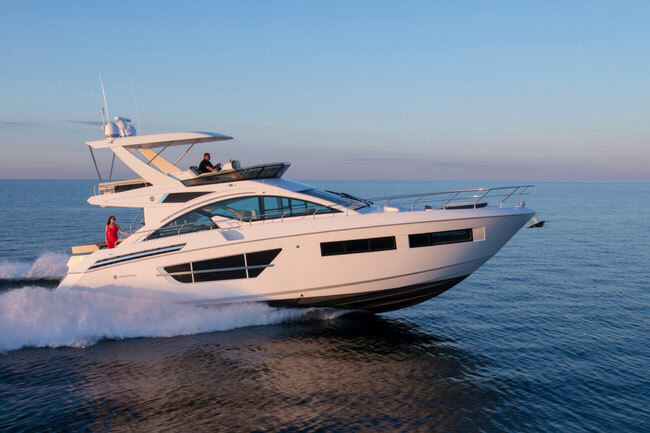 We invite you to meet our entire family of Fly Yachts, Cantius Yachts and Express Yachts along with our full offering of Sport Series Bow Rider and Express boats, including our South Beach Edition Bow Riders and Palm Beach Edition Bow Riders. At the heart of Cruisers Yachts you'll find heart. You'll find an engineering team tirelessly working to produce the next innovative yacht. You'll find third generation employees molding, crafting, and perfecting every detail on every boat. You'll find the Customer Relations department answering every question, working until you are 100% satisfied. You'll find a tight-knit family always willing to lend a helping hand. We may manufacture world-class boats, but we're here to cultivate relationships with our customers. Share your experience with us! We want to hear about the adventures you’re having on your Cruisers Yachts boat, and we’ll keep you updated on Cruisers Yachts news, boating tips, promotions and more! Make sure to explore our site to find the latest catalog, build the boat of your dreams, and find a Cruisers Yachts dealer near you!